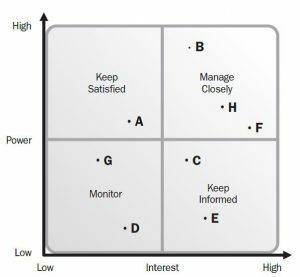 Stakeholder analysis is a technique of systematically gathering and analyzing quantitative and qualitative information to determine whose interests should be taken into account throughout the project. It identifies the interests, expectations, and influence of the stakeholders and relates them to the purpose of the project. Identify all of them: the first step is to identify all stakeholders as early as possible. Stakeholders discovered late in project will likely request changes, which can lead to delays. Determine their Requirements: This is neither easy nor fast, but one must make every effort to obtain as many requirements as possible before work begins. This applies to change driven projects as well as plan driven projects. It’s essential to determine as many as requirements as possible upfront for both. Determine their expectations: These expectations include what stakeholders think will happen to them, their department and the company as a whole as a result of the project. Expectations tend to be much more ambiguous than stated requirements, or they may be undefined requirements. They may be intentionally or unintentionally hidden. Once captured, expectations are analyzed and may be converted to requirements and become part of project. Determine their Interest: You may also find that certain stakeholder are particularly interested in working on some part of the project, getting a chance to learn new skills, getting a chance to prove their skills, or maybe just getting out working on certain parts of the project. A great project manager/business analyst determine each stakeholder’s interest related to the project and, where appropriate, will attempt to either build these interest into the project or implement them as a reward. Determine their level of Influence: To some degree, each stakeholder will be able to negatively or positively affect a project. This is their level of influence, and it should be identified and managed. Plan how you will communicate with them: Planning communication with your stakeholders is also critical. How can you keep stakeholders involved and get them to relate their thoughts and concerns if you haven’t planned out how information will be shared in the project? Remember also that communications are the most frequent cause of problems on projects, so careful communication planning can help prevent problems. Inform:You provide the stakeholder with an appropriate level of communication, generally either PR or reporting. Manage:You direct your communication to achieve a desired change in the attitude of the stakeholder or to manage an emerging situation. Consult:You invite the stakeholder to provide feedback, analysis, and/or suggest alternatives to help develop a better outcome. Involve:You work directly with stakeholders to ensure that their concerns and needs are consistently understood and considered; eg, the business representative involved in an Agile sprint). Collaborate:You partner with the stakeholder to develop mutually agreed alternatives, make joint decisions and identify preferred solutions; eg, typical ‘alliance’ and ‘partnering’ forms of contract. Empower:You place final decision-making in the hands of the stakeholder. Stakeholders are enabled (but also need to be capable) to actively contribute to the achievement of ‘their’ outcomes. Overall time and effort spent on stakeholder engagement will pay dividends, stakeholder engagement is simply the most proactive way of helping your stakeholders to help you deliver their requirements successfully.